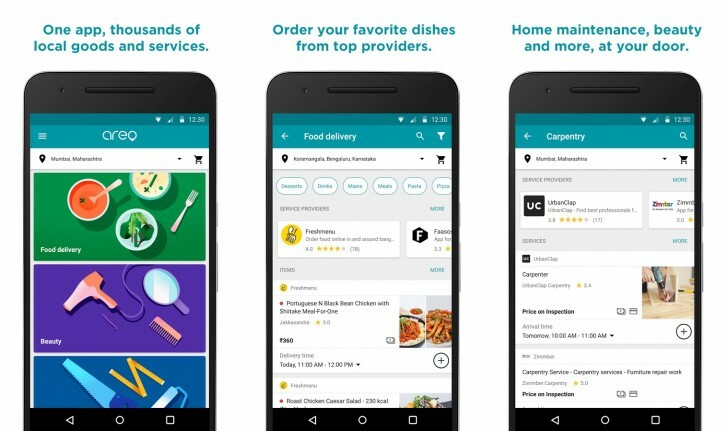 Google has launched a new service called Areo, which will let you order food as well as arrange for home services. The service is available only in India for now (that too only in Mumbai and Bengaluru) and the app is only available on Android. Areo will ask for your location and then list all the services available in your area. The first is food delivery service, where Google has partnered with Freshmenu, Box8, Holachef, Faasos and more (depending upon location). You can see the prices of the items and order them directly from the order, and the app will push the request to the service provider and they will take over from there. But Areo goes beyond simple food delivery service (of which there is no shortage in India right now and has become a growing market) and also offers home services. This includes home maintenance stuff like appliance repair, carpentry, electrical work, pest control, plumbing, house cleaning, etc. There are also other chores such as car wash, laundry, packing and moving and cooking. You can also book a personal fitness or a waxing and pedicure appointment through UrbanClap. The list includes even more things such as house painting, accounting, mechanic, chauffeur, shoe repair and even astrology readings. All of these services are subject to your location, even within the two currently supported cities. Depending upon where you are some or the other options will be disabled. The app currently features service providers but over time more should be added. It should also likely arrive in other regions and be available on iOS. I actually love to see more of them. They are very capable people. But I dont like their attitude of racism. I am a supporter of equality. Just because they represent the world most powerful companies doesnt mean they can do anything they want.